Its Andrea back again to wrap up the week at Gegorges island. Yesterday, was the end of the week out on Georges island. It was really hot out but Kharlyia and I made it through fishing. We had about five different groups that had signed up for fishing but only two groups showed up. With that being said, the two groups that showed up had more time than usual to fish. They were really small groups too. The first group only had three kids and the second group had about ten. When those groups were fishing, they did not catch anything on the fishing rods but they did catch lots of crabs in the crab trap. Once the groups were done fishing, they went about exploring Fort Warren because many of them had never been to Georges island before. The last hour or so, Kharlyia and myself were left alone on the fishing pier. That meant that we were fishing just the two of us. We changed it a little bit. Instead of fishing at the same spot we split ourselves. Kharlyiah went fishing on the opposite side by the visitor center and I went fishing in front of the Boston Harbor Cruises dock. 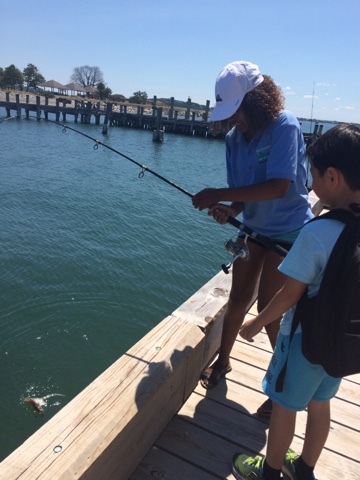 Fishing at Georges is very difficult due to all of the boat trafficking of Boston Harbor Cruises and water taxi coming in and out. Somehow where I was fishing, I kept on getting a lot of bites. Every time I had a bite, I would yell out for Kharlyia and she would come running down to me to see if I had caught a fish. Unfortunately, the bites was not what I was expecting. 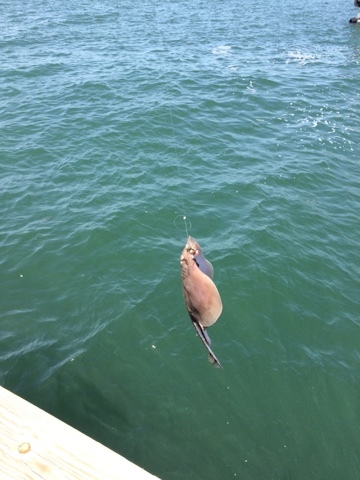 I was looking for some striped bass but I ended up hooking a skate. Kharlyia was brave enough to push down on the spiky skate as I removed the hook from its mouth. At first I thought that the skate did not make it but once we put it in the touch tank, it was alive so we sent it back to the ocean. No mattet which site I go, I always catch skate while aiming for some bass. Its like the skates knows me really well or they just love me. Although its not a bass, I still get excited because I get to tell the kids that we did catch something. The kids finds it really interesting how it looks like a sting rat. ai may not catch what I want but atleast I always end up catching something. I am really loving fishing with the kids. I cant wait to catch more and more stripe bass and skates.